And Schiff confirmed as showrunner! As a huge fan of The Americans, that’s great news. Even if the official title is A New Hope, most people still know it as simply Star Wars. Why does the source of the footage matter if it blends with the surrounding footage? Or do you just hate TLJ so much that you can’t abide repurposing any footage from it for a fan edit? Why not? That sounds like a great idea to me. With 20th century in Disney’s grasp, what are the odds of an OUT release? I mean, this site was founded, what, 15 years ago and all we’ve gotten in that time is the GOUT? I’m surprised there’s anyone who isn’t pessimistic about it. Well then, if you’re including SW material that used to be on Netflix, you’re missing Solo from your list. I watched in on Netflix not long after it was added (though I can’t confirm if it’s still there or not). Can’t remember if TFA ever was, though. TLJ, Solo, RO, and TFA have all been on Netflix at one point or another. The only Star Wars content on Netflix are The Clone Wars (both the movie and show), The Last Jedi and Rogue One. They’re going to be leaving Netflix very soon since Disney+ is launching this Fall. Didn’t TCW recently get removed? I mean, if you want to screw up your TV settings for everything else you watch just to make one thing look good, then sure. But there are a lot of internal consistency problems with the LOTR BRs, so even if you wanted to do that you’d have to be constantly tweaking your TV settings throughout the movies. How would you even change that in the context of TLJ itself? Sounds like that would be more a planned change for IX, depending on how Luke’s appearance is handled in that film. Ady has said the entire time that only the OT is canon for his edits, and when he still planned to edit the PT it would have been altered to match the OT, not the other way around. And that he won’t be editing anything to fit the Disney films since there’s no guarantee a future film won’t contradict something he did as we learn more about the new canon - best to keep it all internally consistent with the OT itself, since that’s less likely to cause issues. I mean, that’s literally the only example of censorship in the SE’s. Nothing else in ANH or anything in ESB or ROTJ were censored when it was resubmitted to the MPAA in 1997, and again, both TPM and AOTC were given PG ratings in 1999 and 2002. All three were resubmitted to the MPAA in 1997 for the SEs, though. And then there’s TPM and AOTC, which are both PG. It was brought up a few times last year when the movie came out. No no no, the most important thing is clearly whether the camera will tilt up or down, or pan left or right - or even stay still - after the crawl fades. Wow, those shots look fantastic! How long did it take for 2.0 and 2.5/7 of the DEED to be released? Reason I’m asking is because I want to create an estimate for how long the wait for 3.0 will be. Please don’t turn into [several now-banned usernames redacted]. They’ll be done when they’re done, just like all fan projects where the creator(s) deliberately chose not to give timeframe estimates or target dates. That TIE Interceptor with two triangular wings bugs me. It looks cool, but it has even less visibility than the standard TIE fighter which already has bad visibility. C-3PO with Chewbacca’s bandolier and bowcaster seems like an idea that was floating around during the concept art/pre-production stages of the film before it would be dropped. It doesn’t seem like an idea that Lucasfilm, Kathleen Kennedy and J.J. Abrams would not want to make use of. Too bad. They are. I don’t like the idea either, but this is far beyond concept art. The best case scenario here is it’s one scene that ends up getting cut before December, but if they’re putting it on licensed art, it’s almost certainly going to be in the movie. While there was concept art of Kylo Ren with a repaired helmet on that got leaked even earlier, it is also likely that that idea was dropped as well. No, it’s not likely at all. I’d say the idea being brought up time and time again along with concept and licensed promo art depicting exactly this is a 100% guarantee that this is exactly what is happening in the movie. I have already explained why Kylo Ren would not wear his helmet again, and why the crew have now gone into the direction. Again, I’m not the biggest fan of the idea either, but sticking your fingers in your ears and going “LALALALALA THEY’RE NOT DOING THIS” is just straight up denial and will hurt any chance you have at enjoying the movie. Accept that it’s at minimum likely to happen and you’ll have a better time, even if you still end up disliking the idea. The idea that this is “sketched-out concept art” of that it contains any “scrapped ideas” is straight-up denial, as this is far beyond those stages. 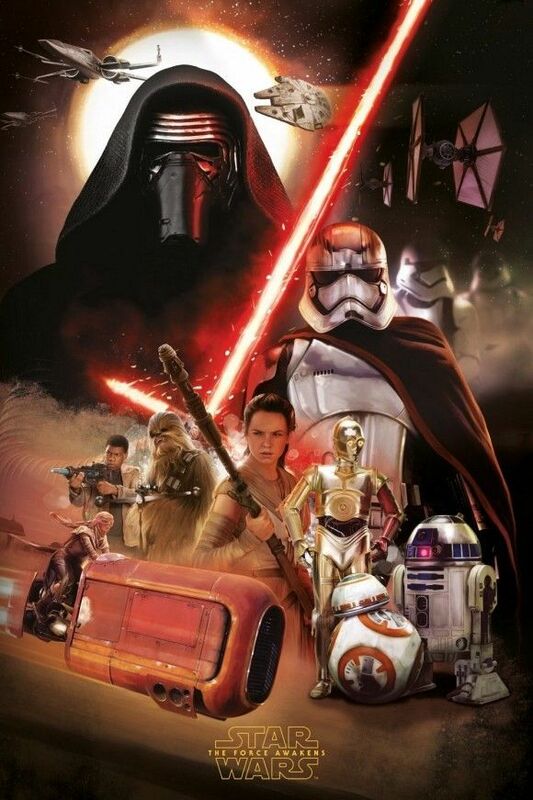 This is near-finalized to the point where I’d be surprised if this exact poster isn’t for sale at Celebration. I do not believe the poster is real. It looks awful. Threepio with a gun? Meme alien face? Horrible backdrop? No thank you please. Oh no, it’s 100% real, but this is definitely more of a Walmart promo poster than anything else. It’s absolutely not a theatrical one-sheet or anything like that. I loathe the idea of Threepio using a firearm. AOTC flashbacks. Auto detection? Huh? That’s not a thing here. And a link to an audio track isn’t the same as a full movie since you need a copy of the movie itself to do anything with it, though I’ll admit that I’m a little surprised the mods have left that link up. The issue is not about being logical or not, the real trick is: this piece of information of the DS being sabotaged by its own engineer is a rationalization of something magical/Force related in ANH, and it was totally unecessary. That’s why I compare that to the midichlorians: going for magic to something… logical, mathematical, biological, rational… it goes 100% against the spirit of the OT and particularly of ANH. When I get some more time I intend to come back and address Shopping’s main post but for now I’ll just address this. Nothing in Rogue One contradicts Luke’s achievement in SW. The struggle in Star Wars is trying to land a direct hit down the thermal exhaust port to set off a chain reaction. Something that all the other pilots proclaim is next to impossible. That weakness in the design whether it was intentional or not has no bearing on the inherit difficulty of exploiting it.